This recyclable sippy cup makes for an easy transition to cup drinking! Thinkbaby's sippy is easy to hold, includes a travel cap, and features a soft silicone spout... just some of its fantastic features. No spill spout - features a cross cut design. Extra soft, medical-grade silicone, a spout provides easier transition from baby bottle feeding to sippy cups. Thinkbaby has won multiple awards based on the ease of transition of their line. When you are ready for a straw cup, simply purchase the straw top! No need to invest in another cup! The Thinkbaby Sippy Cup is top shelf dishwasher safe. Generally speaking, we find that things with small ridges often need hand-washing to really do the trick! 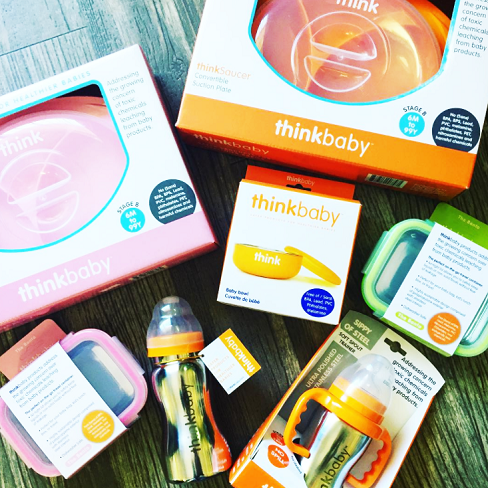 We love the folks at Thinkbaby and have enjoyed meeting them and talking with them over the years! Over the last 7+ years, they have provided products for various fundraisers for diabetes, child abuse, autism, and cancer organizations, and have provided direct aid to catastrophes such as the Texas fires and Haiti. In addition, they have been proud donors to Texas4000, Healthy Child Healthy World, Environmental Working Group, and St. Jude. While several companies have begun to jump off BPA-based plastics, many are pursuing new plastics and materials that have not been properly tested. Thinkbaby and Thinksport employs the precautionary principle when choosing materials to work with. It is important to us that through the life cycle of a product, it does not cause harm to the user or the environment.